It’s been announced since August 3, but it just occurred to me that it hasn’t been announced on Flayrah yet. This coming Sunday, October 21, from 8:00 p.m. (EST) in the evening until 5:00 a.m. the next morning, Turner Classic Movies will feature “Rare Animation” including three features and eighteen shorts, hosted by TCM’s Robert Osborne and the Cartoon Brew’s Jerry Beck. The three features will be the Fleischer Studios’ Gulliver Travels (1939) at 8:00 pm., Mr. Bug Goes to Town (1941) at 9:30 p.m., and Lotte Reiniger’s independent silent The Adventures of Prince Achmed (1926) at 1:15 a.m. the next morning. It is Mr. Bug Goes to Town, a.k.a. Hoppity Goes to Town, that makes this of interest to Furry fans. Billed as “The screen’s first full-length musical comedy cartoon”, the Fleischers’ second animated feature film has an all-insect anthropomorphized cast. Hoppity, a grasshopper, is in love with Honey, the bee daughter of kindly old Mr. Bumble Bee. But the whole insect community in a garden at the foot of a huge building is in danger from humans who are stepping unwittingly on the insects’ homes. Complicating matters, the greedy leader of Bugville, the pompous C. Bagley Beetle, has plans to take over Mr. Bee’s Honey Shop and to force Honey Bee to marry him. Hoppity tries to foil him, but Beetle’s two henchmen, Swat the fly and Smack the mosquito, seem to stop Hoppity at every turn. There would not be another animated feature featuring bugs until the 1990s with Antz and A Bug's Life. The feature has problems (long dull stretches between the songs), but is still well worth seeing by all Furry fans. It has occasionally been shown on TV, but this is a rare opportunity to see an uncut, restored print without commercial interruptions. If you can’t be at your TV’s next Sunday at 9:30 p.m., set your Tivos. 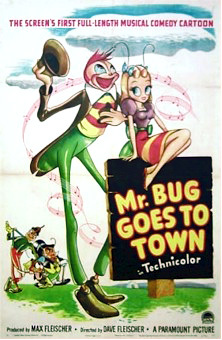 The Cartoon Brew, which has been heralding TCM’s “Rare Animation” program all month, has a link to the TCM magazine’s in-depth article on Mr. Bug Goes to Town by John Miller. I don't get TCM, and all three movies I want to see! Heck, NEED to see as a cartoon reviewer. I've been kinda inspired by your retrospectives and want to try my hand at some "retro reviews" maybe starting next month. I'm mostly talking movies, though I am planning on reviewing David Garnett's "Lady into Fox" for Halloween (it's a ghost story and even horror story by my definitions), kind of like I did with Clive Barker's "Sacrement" last year. I'm kind of info-dumping here, but I've got a comic book review I need to write, an awards column, a review of the new Pokemon games, plus another opinion/pretensious essay on horror, but my computer is on the fritz, so Green Reaper will probably get them all a bit late, unless I come up with an alternative soon. But anyway, if you have TCM, at least watch the bug movie (which has more A.K.A.s than a Mafia hitman). I've heard ... mixed things, but it sounds fun at least. Also, I always suspected that "Kung Fu Panda 2"'s credits featured a shout out to "Prince Achmed". They both feature shadow puppets, and one of the depicted scenes seemed a lot like one of the more common screen grabs from the silent film. "The 14th Annual Animation Show of Shows Starts Tuesday October 16th and is coming to a screen near you! It's already that time again and I've assembled an awesome collection of 13 new short films. Included are the grand prix winners from Annecy, Hiroshima, Zagreb and loads of other festivals. Included are John Kahrs inspiring romantic Disney short PAPERMAN (USA), Till Nowak's hysterical THE BRAIN CENTRIFUGE PROJECT (Germany), Michele Lemieux's NFB dazzling pinscreen masterpiece HERE AND THE GREAT ELSEWHERE (Canada), Pixar's own Carlo Vogele's independent operatic fish tale UNA FURTIVA LAGRIMA (USA), Russian Dmitry Geller's enigmatic new short made with the help of students at Jilin Animation Institute I SAW MICE BURYING A CAT (China), Martin Zivocky's stunning graphic graduation film THE CASE (Czech Republic), Martin Georgiev's intense 7596 FRAMES (Bulgaria), Supinfocom's A+ graduation film by Antoine Robert, Dorianne Fibleuil, Paulin Cointot and Maud Sertour's surreal comedy LE TAXIDERMISTE (France), Israeli born, Tomer Eshed's 3D phenomenal and over the top 3D HFF graduation film FLAMINGO PRIDE (Germany), Warner Bros. newest 3D short made brilliant by Matt O'Callaghan DAFFY'S RHAPSODY (USA). And if that's not enough, THERE'S MORE! But first a PARENTAL ADVISORY, this part of the program may not be suitable for children. On the edgier side and definitely lighting the adult flame on the tail end of this show with Emma de Swaef and Marc Marc James Roels OH WILLY! (Belgium), kicking up the intensity with Supinfocom's graduation film by Loris Accaries, Marie Ayme, Claire Baudean and Audrey Janvier with writing and undulating... TENTATION (France) and lastly Michaela Pavlatova's sexual fantasy on a TRAM (Czech Republic). And while you're there, LIKE the Facebook page. If you don't see a screening near you, feel free to write me at rjd@acmefilmworks.com to coordinate a screening in your area. * All screenings marked with an "**" require rsvp confirmation and are open to animation professionals, students and fans. Request a confirmation for you and one guest at rsvp@acmefilmworks.com, include the theater, date and time in the subject and in the message include your name, and that of your guest with both of your emails and cel numbers. NAMES WILL BE CHECKED AT THE DOOR. All screenings marked with an "*" are open to animation professionals, students and fans on a first come first served basis. All other screenings are closed to the public." Thanks Fred... I always attend this show and have met many of the directors there, and even met my girlfriend there (2 years this month). An incredible program. If this is an annual event, I might have to check one of the showings out. Thank you for the information. Despite many biting critiques of this Fleischer feature, it is considered one of the classic early American animated features. I personally like it much better than "Gulliver's Travels".